Recently, I overheard a friend say, “I am done with holidays.” She explained that holidays were just too stressful and gave her too much to do along with having to deal with the drama that often accompanies family gatherings. Since I know this person well, I also know that these words really characterize her whole life. She always has too much to do, and she’s always stressed. Which basically means that the holiday (Thanksgiving in this case) undeservedly received the blame for her stress. Our culture is one of busyness, and I truly feel burdened for those I know and love who are simply too busy. This burden comes from living in that reality, being broken by it, and rebuilding a simple life without the weight of busyness. In other words, I’ve been there and know the way out. More importantly, I know that there IS a way out. Much of this busyness comes from the seasons of life. Kids need attention, loved ones are sick, work is overloaded and ministry calls. This busyness, to a large extent, is simply the inevitable busyness of life itself. But busyness reaches toxic levels when we, by deliberate choice, choose to do more than we are capable of doing. These are the things we say “yes” to because we “should” or because “someone has to do it.” They are the things born out of perfectionism and long-standing habits. This toxic level reaches epic proportions when we pile on “things to do” as a way to avoid doing the hard work of creating a balanced life focused on true priorities. Instead, we get lost in the multitude of activities, obligations and commitments. When we’re too busy, we don’t have time for deepening relationships. We don’t have time to work through issues that created rifts. We don’t have time to read that which would deepen our character. We don’t have time to get the rest we need. We don’t have time to make healthy choices. And, worst of all, we don’t have time to spend one-on-one with God. But my friend who said, “I am done with holidays” actually got at a very important point. Busyness and overload seem amplified during the holidays. We may casually notice at other times, but busyness suddenly jumps out as out of control during the holidays. The time between Thanksgiving and New Years seems to magnify the need to slow down and enjoy friends and family. It emphasizes the crucial need to worship God made flesh, which has a way of making us realize our desperate need for a simpler life. Many people feel trapped in busyness. They realize that busyness creates an inner conflict that seems impossible to reconcile. This becomes amplified during the holidays and is really why my friend meant when she said, “I am done with holidays.” With that in mind, let’s explore three ways to reduce busyness and discover simplicity no matter the time of year. 1.) Make small changes. Small changes done consistently over time add up to make a huge difference. Becoming instantly un-busy won’t happen, but making small adjustments will slowly reduce busyness. Taking your time with this process rather than trying to “quit cold turkey” increases its staying power. 2.) Accept the painful truth. You will have to say “no” to some good things. You will have to let things you really want to do go in order to do the things that are truly important. 3.) 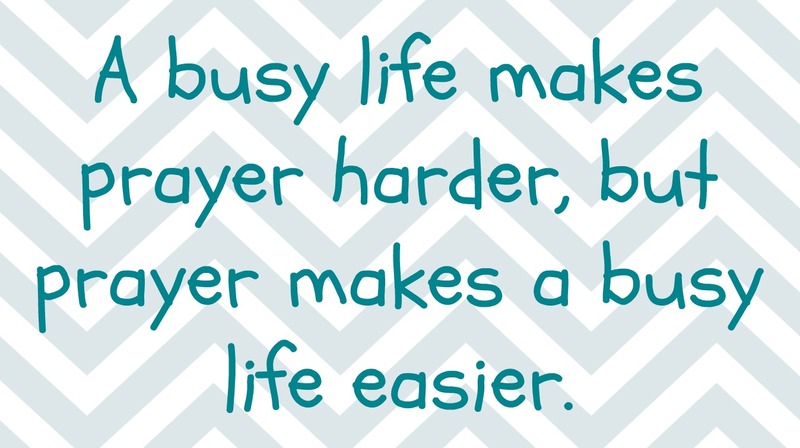 Commit busyness to prayer. Ask God to show you how to become less busy. Ask Him to show you how to simplify. And most importantly, ask Him to change your heart towards busyness and to help you realize that obedience to Him does not mean saying “yes” to every opportunity that passes through your awareness. Transforming a busy life is really hard. It requires brokenness. It requires letting go of attachment to accomplishments. It means admitting that under our own strength, we try to do too much. And it means admitting that without some help and without deliberate choice, we will continue feeling the increasing weight of busyness. This entry was posted in Simplicity, Struggle and tagged 2", amplified, balance, blame, busy, busyness, change, character, choice, commitment, commitments, conflict, deliberate, drama, family, focus, friends, habit, habits, health, important, kids, love, magnify, obedience, opportunity, overload, overloaded, perfect, perfection, perfectionism, power, pray, prayer, priorities, process, read, relationships, rest, Ruth, serve, simple, simplicity, simplify, small changes, strength, stressed, struggle, time, trapped, truth, victory, words, work by admin. Bookmark the permalink. 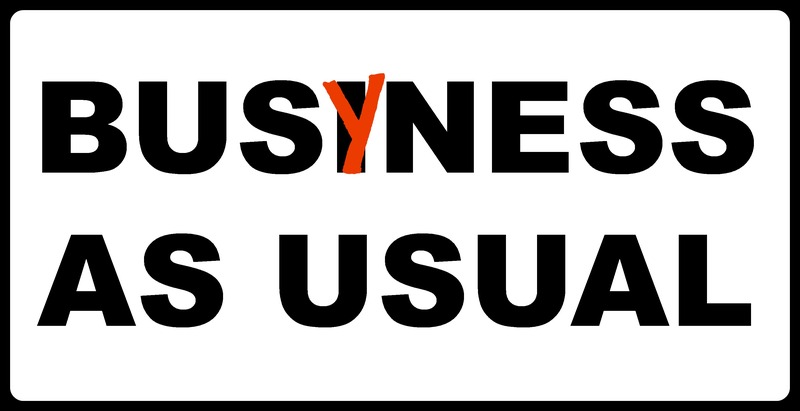 Busyness is on issue I've been dealing with lately. On top of my full-time job, I pick up ongoing side work to generate extra income. Combine that with writing two blogs, trying to fit in exercise, and assisting my wife with writing her cookbook, I've recognized that this level of busyness isn't sustainable. It's hard for me to say "no," but I'm going to have to cut down with a baby on the way. I've reduced my blogging schedule to about one day per week, and that has helped some. I'm considering ways to add more "margin" to my life in 2014. I've been there Chris. Simplifying really is the only way to reduce busyness and keep overload at bay. Over time, as I simplified, God changed my heart to focus in more on what He wants me to do. The things I struggled saying "no" to aren't even things I think about often anymore. And when that little one arrives and starts growing, you'll have no regrets for cutting out stuff. I promise you that. There are LOTS of good resources to give you ideas on creating margin. Let me know if you're interested in hearing about them. You've hit on a key point – God has to change our hearts on what deserves our time and attention. Sure, feel free to pass along any resources. Also, I've been reading some minimalist blogs about decluttering, so we're working on cleaning out the house before the baby, too. And it's a change that happens gradually over time. I am amazed at how what seemed SO important to me just four years ago really doesn't blip in my radar anymore. It's very freeing. Minimalizing at home will really help for sure. But it's also an ongoing process. I've eliminated a lot, but I see so much more to eliminate. Sounds weird, but my goal for truly being minimal is when my youngest graduates high school in 6 years. That will mean a smaller house plus less "needs" to meet within it. If you've never read Loren Pinilis's blog Life of a Steward, I recommend checking that out for sure. Both blog posts & podcasts are excellent. For books, I really got a lot out of Richard Swenson's material. Those are the two that immediately pop into my head, but I will definitely let you know of others as I think of them. Oh, and feel free to bounce any thoughts/ideas off of me. I have done a lot in this area over the past four years. Maybe my experience will help some. Thanks for sharing the tips and resources. I just have to realize this process will be slow, and it's better to tackle it little bits at a time instead of wanting it all done now! You hit on a huge key, Chris! Small steps done over time truly do add up to make a huge difference. This gradual progress sure does create habits that last too. Keep this perspective. It will serve you well. I think some of the problem, at least for me, is we/I have been conditioned that to be busy means you are not lazy and unproductive. Neither which are right. 🙂 I have to admit I struggle some with this even at my age, but nearly as bad as when I was younger and felt a real pastor would work, work, work. I am seeking a balance now. How much of that conditioning do you think involves resisting the pull of our culture? Is it pleasing God over man? Also, one thing I have learned is that productive looks very different from one person to the next. It took 10 years into my marriage before I was okay with my husband working around the house while I read or wrote, finally realizing that we simply process life a bit differently. Good tips. So many of us are so busy that we forget to enjoy life. This is the first Christmas that I'm not sending out Christmas Cards. I love sending out cards, but I just don't have the time this year. So instead of stressing myself out, I'm just not going to do them. Not sending out Christmas cards is a great example of saying no to good things in order to focus on better things. Some years we send them out, some years we don't. Really depends on whether or not we make the time to do them. You really have to make choices and they almost always are choosing between what is good and what is best. We can not let good drag us down. It is hard to let some things go but much better to do a few really well. About a year ago, I had a friend over for lunch to talk to her about vitamins and my way of eating (multiple food allergies/sensitivities make it very different from most people's), and she was getting overwhelmed at the many changes she could and should make. I had the "bad – good – better – best" discussion with her related to food. I told her that just taking small steps, from bad to good or good to better for example, would help her make healthy progress & not be so overwhelmed. I think this approach could work in almost every area of life. If I could get my head around it even more, I think it would make a great blog post. As usual, you stirred a new direction for me Mark! Good one. For the first time in over three years I missed a posting on my site. Good things and our gifts can be turned into bad things when we let them take precedence in our lives. Thanks for the reminder. Thanks. Oh, and I bet it feels really uncomfortable, doesn't it? You are so right that good things can turn into bad things when our focus is wonky. In my reply to Mark, I talked about moving from bad to good to better to best, but as you point out, we can go in the other direction too. Thanks, Kari – good points. I am usually not a busy person, but have been for the last two months as I was trying to get my book out by Christmas. I'm back to not being as busy again now that it's out, which is a relief! The trick for me is to find that balance – to use my time well when I'm not busy. I did learn from this last project though – to not say I'm going to publish something on my blog until I have a clear idea of when I will reasonably be able to get it written by! Good for you for being able to not get too busy on a regular basis. I think "for a season" is okay, because there's an end-target and it truly isn't a lifestyle. The problem I see a lot is that "for a season" has become a way of life for many people. Balance is SO important for sure. It differs from one person to the next too. And, I really like how you noted learning from a recent project. Assessing like that for positive changes in the future is a huge part it finding & maintaining our balance. Great points! I appreciate that you are recognizing what many won't acknowledge, that busyness is not just about better time management. It's about how we live our lives, think, and act. Busyness is a lifestyle that is promoted in so much of our society and the church has gotten on the bandwagon for sure. I've found out, no one is going to make you less busy. You're going to have to work on it yourself and if you're a people-pleaser (like I have been in the past), it does require wrestling and brokenness to follow through. Anyway, good thoughts and advice here, Kari. Thank you. Terrific points throughout your comment, Jason. 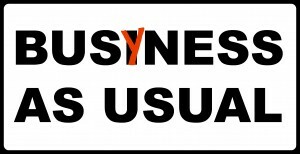 First, busyness truly is a state of mind. Second, busyness is a culture, and the church has certainly got on board with it. My church really struggles with it, and it's probably the biggest problem I have there right now, and some days I really battle with it. Third, overcoming busyness requires taking ownership. You have to choose it for yourself and quit blaming others. Within this is the idea of blaming your schedule. Seems like many people think it magically gets filled up. Finally, becoming less busy requires brokenness and struggling. You have to recognize the problem and your inability to deal with it on your own. Then, struggle with the small steps to make improvements. If you're struggling with something, you haven't given in. 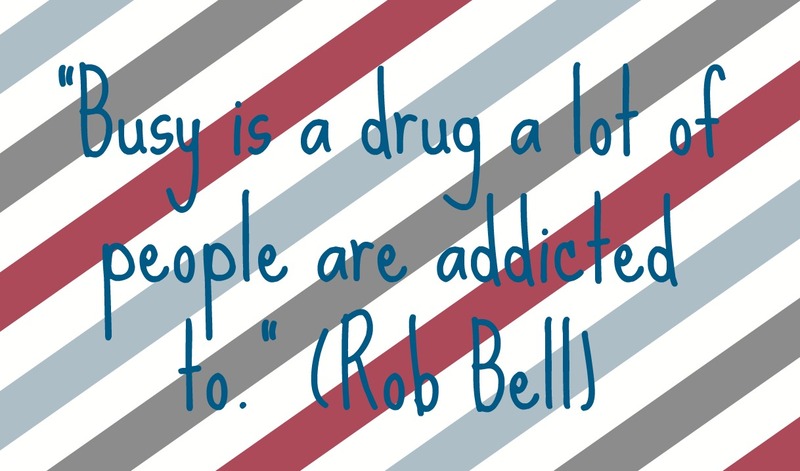 Too many people have quit struggling & let busyness overtake them. I think you and I just wrote another blog post! The more and more I've thought about this, the more and more I realize that it really is a heart issue first and foremost. I don't think the solution is always to have less to do. For one, we can procrastinate, waste time, and stretch out almost any activity level into an uncomfortable lifestyle. Secondly, there's nothing inherently wrong with doing a lot. I imagine Jesus was quite busy. I think it's a problem when it crowds out other things – and in that case, it's often a symptom of a deeper heart issue than the problem. I totally agree, Loren. (I believe you wrote about it on your most recent post, which I started reading & haven't gotten to finish & comment yet.) Busyness is a mindset, and it's a sin when we put it and anything it contains above God and what He desires for our lives, most importantly relationship with Him. 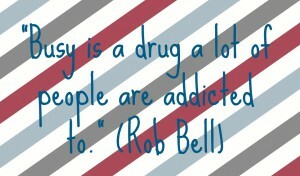 I also believe busyness is relative. My husband can handle a lot more activity than me, but I don't believe he's sinful in his level of busyness because of where His priorities are placed & proved by His actions. There's a lot more to address with this issue for sure, and I look forward to you developing your thoughts on it even more. I really have to remind myself to commit these things to prayer. 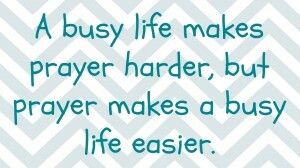 It seems the busier I get the less I tend to prayer. However, when I finally do stop and take that time to pray then even the busiest days seem to run more smoothly, at least from my perspective. When we commit our schedules to Him in prayer, they become Him schedule. I love how He works my schedule out to fit all that's important to Him when I let Him plan it rather than bless what I have planned. I've found being specific in what I do is so important. To know what I should do and should not do. To determine the best tasks that would produce the highest return on my time and energy. My high priority tasks include: faith, family, work, and platform building. Even within those specific areas I have to be wise about how to spend my limited time within those areas. For example, I know I can't spend all my time on social media or reading/commenting on other blogs because I need to focus on content creation. OR I can't spend all my time together with my son and wife because they need individual time as well (Mainly my wife). Focusing on my top priorities allows me to out of a busy mindset. Great post and thoughts! Thanks, Dan. What you are really getting at is the necessity to be deliberate & intentional about our focus as well as keeping it simple. Great examples! Btw, your blog & comments there & elsewhere definitely reflect your deliberateness in this area.